I'm not sure how I feel about this series. I really want to like it, but the premise is reaching a tad: A tourist town of bookstores?! I love books, but a town full of nothing but bookstores and that's the main attraction?! Uh, OK. What is making me teeter about giving the series a shot are the secondary characters. I'm intrigued by Angelica. For some reason she reminds me of Andrea (Hannah's sister of Fluke's cookie shop series). Tricia owns a bookstore in Booktown. 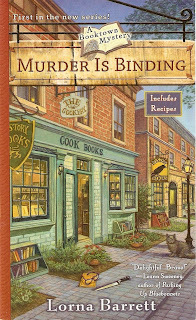 Everything's going OK, until her neighbor, Doris Gleason who owns the Cookery, is murdered. Turns out Doris had a high-priced booklet she just bought and in the middle of a rent war with her landlord, but Tricia is the prime suspect. To add on to Tricia's woes, her sister, Angelica, swooshes into town hot off another divorce and looking for comfort. Much to Tricia's chagrin, Angelica finds it in the quaintness of the town and Bob Kelly, Booktown's landlord. In the interim, Tricia runs into Winnie and buys an old pin, some books, and information about Doris's purchase. Then Winnie dies, but the police aren't interested. Doris's murder and an article by Russ Smith, marks Tricia as the town jinx. But not everyone is keeping distance from Tricia, Mike Harris is keeping close, perhaps a little too close. And Tricia finds some living skeleton's in the Harris household. After poking her nose around, Tricia and Angelica find the answers to the murders of Doris and Winnie. Aside from Booktown's premise, what irked me about this book is the protagonist's smugness in one scene. They find the missing booklet and Tricia proceeds to tell the sheriff the proper way to get prints off the book, after it's been handled by several people. I hadn't heard of the final procedure, but a quick Google search showed me what it was. Considering this is a small town and the sheriff could care less about the book's condition, I don't think Tricia's opinion would matter and I'm sure the sheriff enjoyed being told how to process prints. But then the protagonist didn't stop there, she kept going on and said the following: "I deal in mystery fiction. Not only do I read the classics, I read contemporary authors like Patricia Cornwell, Kathy Reichs, and Elizabeth Becka. You can practically get a degree in forensics just by reading these top authors." ARGH!!!!!! I'm going for my forensic degree. Granted, it's only an Associates, but it's a start. You study more than fingerprints (which are very difficult to collect, process, and identify) and while the authors might have forensic degrees, there are a lot of liberties when writing the books and some methods are no longer used or new ones have pushed the edge of the horizon. One book I gave up on was written by two authors who had degrees in forensic. I had to give up on it because some of the things written in there were wrong and the author got away from the mystery. I don't think I could've gotten a degree from reading that series. I accept when I pick up a cozy mystery, there are going to be a lot of liberties, but to make statements like this, goodness. Maybe the next book will be better. However, I agree, the protagonist sounds insufferable! Hay-on-Wye has other local fare, such as food markets and eateries. This town had one diner, the Bookshelf Diner (which Angelica lamented about). Many of the tourist were the senior citizens in nearby communities. Hay-on-Wye looks very interesting and if I ever cross the pond, I might have to check it out. The protagonist was trying. Not a good sign when the secondary characters outshine the main one. She reminded me of people who watch L&O, CSI, and such and think they know how to solve crimes. I admit watching L&O and some of the mistakes they make *GAH!*. I've tried to watch CSI, but the urge to bang my head against the wall overwhelmed me. I like Forensic Files, but it's still not enough to earn a degree, just enough to whet the appetite. I can suspend disbelief for so long, after that, it turns into a MST3K episode.